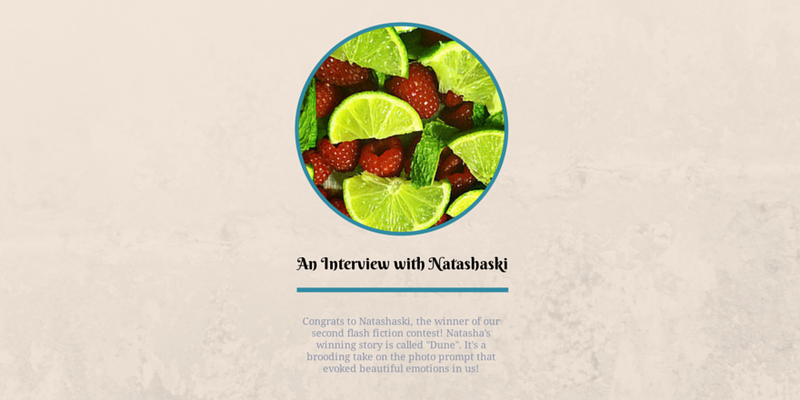 Although Natashaski is new to the writing world, we were wowed by her flash fiction story she submitted for the Short Story and Flash Fiction Society contest on September 26th, 2014. She is beginning her writing and blogging journey at the Vagarious Voyage. She also takes beautiful photographs, which you can find here. We used a pretty photo from her gallery in the header image! Check out her work! 1) From where do you draw your inspiration? My inspiration comes from the world around me, which, I know, seems like a silly and vague answer. But stories are happening all of the time and the world is an inspiring place. People are fascinating, nature is magical, and the objects in between are wondrous. Even if I am not focusing on my writing, I love to see the world as fuel for inspiration in everything I do. A dirt road I’ve never driven down, a well-prepared meal, an interesting person next to me on the airplane. What inspired me most about the house filled with sand was the peacefulness of the photo. Rooms have been deserted and filled with dry ground-up rock, and yet I sense that the place is actually filled with joy and wonder. I wanted to capture that in my story (and I think I will have to work with the prompt from a different angle to actually capture the emotion I was going for). 2) Tell us about the country club story on your blog. Who told you you should start the blog? What did you think? Natasha (that’s my name too!) was a psychology student who had spent the summer doing an internship in town. She attended the Unitarian Universalist church that I attend, but was about to embark on a move to the west coast. Nancy, an Atlanta, GA native, took the two of us to lunch to wish her safe travels and good luck on her new adventure. We talked about Nancy’s teaching career (she is now retired) and Natasha’s current occupation. Nancy has southern charm, and western feminine independence; Natasha is fiercely passionate about her work. Speaking of inspiration, I challenge anyone to have lunch with these two women and not feel like they could conquer the world. At any rate, I am still lost and confused when it comes to my career path, and I am on the hunt for a good fit. Our Unitarian Universalist community is a small group, and we are lay-led. For us, this means that our reverend leads the service once a month, and members of the congregation lead the reminder of the services. It was my turn a few weeks before this lunch, and I spoke about embracing the unpredictability of our life paths. Apparently, I was able to construct an accessible message. Nancy, at our lunch, suggested that I follow writing as a career. I pointed out that writing only makes money with a lot-a-bit of talent AND a-lot-a-bit of luck, but Natasha, who is very internet savvy, suggested a blog. I am resistant to the idea of a blog, as it seems a bit narcissistic to me, saying “This is MY page! Everyone should read MY opinions!” Nancy and Natasha explained that it is a way to make my work available. If someone was interested in what I have to say, I would then have a place to direct their attention and share my projects. This makes sense, since, contradictory to my feelings about the narcism of a personal blog, I do actually have a photo page, which I shamelessly promote to my family and friends. www.flickr.com/photos/4natasha4/ (for anyone who is interested). The difference might (?) be that many of the photos I want to share with people are from events that they participated in. In the end, my own personal blogging experience began, thanks to the optimistic support from my friends at the country club lunch, followed by a weekend with established writers and multiple discussions about promoting work and getting published in different forms. My intention is to hold myself responsible, actually writing instead of only talking about it. If people begin to read and enjoy my work, it will be an incredible bonus. For example, this contest. YAY!! 3) Which are your favorite kinds of pieces to write, and why? I also like to write essays. The “formula” of an essay is one of my favorite ways to structure the thoughts jumbled up in my head.4) Are you planning on releasing any books, collections, etc.Someday! Publishing a book of some kind would be amazing! Currently, I do not have any writing that is “complete” enough to consider as a full project. But hopefully this “Vagarious Voyage” page will help me structure something for publication. 5) If you could meet any writer, dead or alive, who would it be and why? This question is impossible, and I could probably answer it a thousand times, with a different answer. I would like to meet Lewis Carroll, because the language in Jabberwocky is brilliant. I would like to meet the editor of Elle Magazine, because even though it looks like a fluffy pop-culture glossy on the newsstand, the articles inside are insightful, empowering, and well-written. I would also like to meet George Orwell, because his creative portrayal of political constructions are genius. Also, some of the best people I know are writers that I have met in college classes, or writing workshops. It is always inspiring to meet creative minds. Thank you, Natashaski, for your great story! Congratulations again, and we’re excited to feature your interview here on the site. You can read Natashaski’s winning story here if you haven’t already done so.Thanks again to all of our entrants. Subscribe to us to keep up to date on new contests and events!